Q. Why is my ad not posted yet? A. The number of people posting fraud ads have caused us to require some type of proof of purchase for Wheelchairs. Q. I forgot my password? How do I receive it? A. From the login page, under the login button, you will see a small link that says, “Lost Your Password?” Click on that link, and then it will ask you to enter your email you used to sign up for your account. It will send you your new password to your email. Q. I lost my password, I sent for a new temporary password and it was sent to me, but now I can’t figure out how to change my password. A. Click here for directions on how to change your password. Q. I have lost both my username and password, please help! A. Please send us a help ticket by clicking here. Please have your email attached to the account and username. We will send you a temporary password. 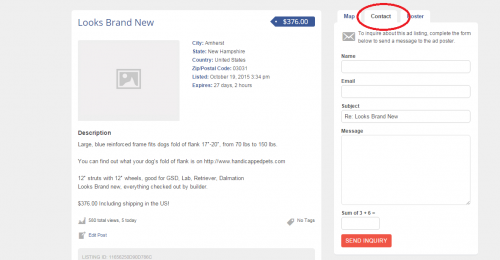 Q. I’m suspicious about the person I’m buying my dog wheelchair from. They are asking me to pay for it through strange online money services such as Western Union. What should I do? A. Never send anyone money over the web that you do not trust. Always ask them to use a secure money transferring service like PayPal. If a seller is ever dismissive of alternative payment options, it is most likely a scam and you should not send them money. 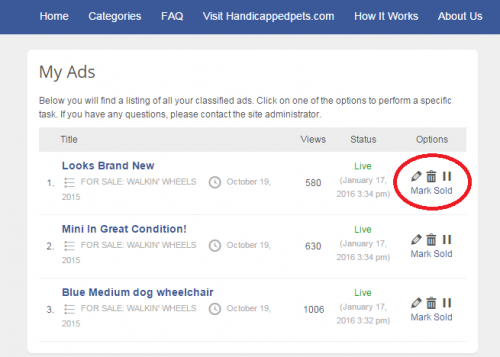 Q. I have sold my wheelchair but the ad is still there and I am still getting offers. How do I delete the ad? A. When you log in, you will be directed to your dashboard. This will have all your current listings. Under options, you will see a pencil, x mark, and pause button as well as a link that says, “Mark Sold”. 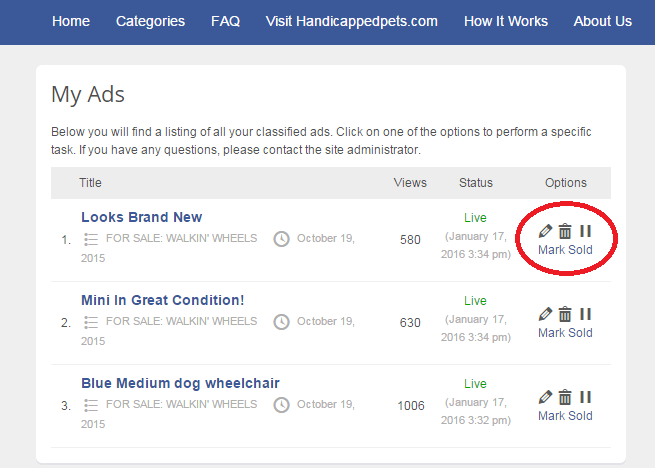 If you would like to delete your ad, select the x button, if you want to mark your ad as sold, click, “Mark Sold”. See image below. Q. Its been a couple weeks since my ad was Approved, why is it back in a Pending Status? A. Approved Ads will stay posted and visible for two weeks. After this time you will need to send us a help ticket by clicking here so that we can post your ad again. Q. I want to make an offer for an ad, but the poster didn’t provide contact information in the ad. How do I contact them? A. On the ad page, you will see a column to the right of the ad that has three tabs labeled, Map, Contact, and Poster. The map tab will be open by default. Select the Contact tab and fill out the brief form to contact the poster of the ad.